This article on the Iron Curtain speech is from James Humes’s book Churchill: The Prophetic Statesman. You can order this book from Amazon or Barnes & Noble. Churchill’s “Iron Curtain” speech at Fulton, Missouri, on March 5, 1946, ranks as one of the most famous and consequential speeches ever made by someone out of high office, comparable in its force to Lincoln’s “House Divided” speech of 1858 and Martin Luther King’s “I Have a Dream” speech of 1963. It is remembered as the announcement to the world of the beginning of the Cold War, although as Churchill knew the seeds had been germinating for some time. It crystallized the new situation facing the United States and Western democracies and also forecast how the new and unusual “cold” war should be conducted so as to avoid World War III and achieve a peaceful future. Although President Harry Truman quickly took the measure of the Soviet Union, it was not yet clear whether the United States would embrace a role as the leader of the free world or would link arms with Britain and other Western European nations in a defensive alliance against the Soviet Union. The status and intentions of Soviet forces in Iran and Eastern Europe were uncertain. There was the prospect of Communist takeovers of the governments of France, Italy, and Spain. America was rapidly demobilizing after the victory over Japan barely six months before, and Americans were looking forward to the material blessings of peace. Churchill knew his warning would cast a pall over the mood of the nation. Truman might have understood the dark intentions of the Soviet Union, but many leading American liberals, such as FDR’s former vice president, Henry Wallace, and his widow, Eleanor Roosevelt, still affectionately referred to the Communist dictator Stalin as “good old Uncle Joe.” It was difficult for Americans, in the space of a few months, to go from regarding the Soviet Union as our ally in war to a potentially lethal enemy. Much of the liberal press was trying to drive a wedge between the U.S. and Britain, while rightwing isolationists opposed any long-term American alliance with European nations. In the midst of these powerful political crosscurrents, Churchill’s Iron Curtain speech prepared the way for the NATO alliance and a Western plan for defense against Soviet encroachment. Regardless of the origin of the phrase in his Iron Curtain speech, Churchill had been looking ahead to this problem since early in the war. In 1970, the retired prime minister Harold Macmillan related to the thirty-year-old Winston Churchill II a conversation he had had with the young man’s grandfather in early 1942. “It was after a dinner hosted by General Eisenhower for the joint Anglo-American command in Algiers, and your grandfather asked me to come back to his room for a drink. ‘What type of man do you think Cromwell is?’ was his odd question to me. An introduction by the president of the United States would afford Churchill a world stage—whatever the venue. Though the date of the address, March 5, 1946, was half a year away, the opportunity fueled his imagination. He may have been out of office, but he was still the world’s foremost political figure, a man whose words could still command attention in the world’s leading nation. The thought buoyed his spirit, as he resumed his role of Leader of the Opposition. In February, Churchill, accompanied by Sarah, sailed on the Queen Elizabeth to New York and then took a train to Miami, where a Montreal friend had lent him his home for some sun and sand before meeting President Truman in Washington. On the last day of February, Churchill took a sleeper to Washington, D.C., where he holed up in the British embassy, editing his address, which he decided to title “The Sinews of Peace,” a play on Cicero’s adage “Nervos belli, pecuniam infinitam” (“The sinews of war are endless money”). Churchill was striking his familiar theme that only preparedness could ensure peace. The Soviet political and military encroachments could be stopped only by a united West under the resolute leadership of the United States. He wanted to shake America out of the game of intellectual make-believe that engendered its cozy confidence in the United Nations. The mask of democratic pretension had to be ripped from the Kremlin’s face and its imperialism revealed. Churchill saw it as his duty to dispel Washington’s illusion (shared by London) that it was at peace with its former Soviet ally. By coincidence, a few days before Churchill arrived in Washington, George Kennan dispatched his famous “long telegram” from Moscow. Clarifying the nature and strategy of the Soviet Union and closely tracking Churchill’s views, Kennan’s report became the cornerstone of the “containment” doctrine. The Soviet threat, he wrote, “will really depend on the degree of cohesion, firmness and vigor which [the] Western World can muster. And this is [the] factor which it is within our power to influence.” Kennan’s message attracted considerable attention within the highest reaches of the U.S. government. Churchill, unaware of the secret telegram, could hardly have asked for a better prologue for his Fulton message. As a political courtesy, Churchill called the White House and inquired if the president wanted to look over a draft of his Fulton speech. The White House replied that Under Secretary of State Dean Acheson would instead call at the British embassy. Lester Pearson, the Canadian ambassador, had already told Churchill that Acheson not only had a sound diplomatic head but also had a keen ear for the elegant phrase. On the train, Churchill finally shared a draft of his Fulton speech with Truman, who expressed his approval. “He told me he thought it was admirable,” Churchill later wrote, after Truman had distanced himself from the speech, “and would do nothing but good, though it would make a stir.” That it certainly did. During the journey, Churchill continued to make more changes and corrections to his draft, even though an embargoed text had already been forwarded to press offices and chanceries around the world. In his “Scaffolding of Rhetoric”—notes on the art of speaking that he had written almost half a century earlier—Churchill had emphasized the necessity of a metaphor or image to give a picture to an abstraction. In his draft, Churchill had mentioned “tyranny,” “imperialism,” and “totalitarian systems,” but those words lacked imagery that would stick in his audience’s mind. Late that night in his stateroom, Churchill surveyed a map of Europe, drawing a black line from the Baltic states to Trieste. By one report, it was then that Churchill added the phrase for which his speech would be known. When the train made its only stop for refueling, Churchill lifted his curtain and saw that they were in Springfield, Illinois, “the home of Lincoln.” Sentimentalists like to believe that the ghost of that other champion of freedom and master of the English language inspired him. The train stopped at the St. Louis station in the early morning of March 5. Churchill took a leisurely breakfast in his stateroom before he and the presidential party switched to a local train for Jefferson City. There, Churchill and Truman entered their open-car limousines for the motorcade into Fulton. Churchill found, to his dismay, that he was lacking the requisite prop—a cigar. So he stopped at a local tobacconist for the purchase. I am glad to come to Westminster College . . . the name Westminster is somehow familiar to me. I seem to have heard of it before. Indeed, it was at Westminster that I received a very large part of my education. From Stettin in the Baltic to Trieste in the Adriatic an iron curtain has descended across the continent. Behind that line lie all the capitals of the ancient states of Central and Eastern Europe: Warsaw, Berlin, Prague, Vienna, Belgrade, Bucharest, and Sofia. All of these famous cities and the populations lie in what I must call the Soviet sphere . . . .
At this point the public address system malfunctioned, but a former army radio technician in uniform sitting under the head table pushed his way through his fellow veterans to find the wire, which he then held to restore the amplification. (Churchill later recorded the speech in its entirety.) The Washington Post reporter, Ed Folliard, who followed only the advance text of the speech, failed to mention the “iron curtain” paragraph in the next day’s paper describing the Iron Curtain speech. Last time I saw it all coming and cried aloud to my fellow countrymen and the world, but no one paid attention. Up to the year 1933 or even 1935, Germany might have been saved from the awful fate which had overtaken her, and we might have been spared the miseries Hitler let loose upon mankind. There was never a war in all history easier to prevent by timely action than the one which has just desolated such great areas of the globe. It could have been prevented, in my belief, without the firing of a single shot, and Germany might be powerful, prosperous, and honored today; but no one would listen, and one by one we were all sucked into the awful whirlpool. Churchill’s reception reflected his audience’s recognition that a great leader had honored their town and college with his visit rather than their appreciation of the stern message. In Washington and around the world, the speech precipitated a storm of denunciation. 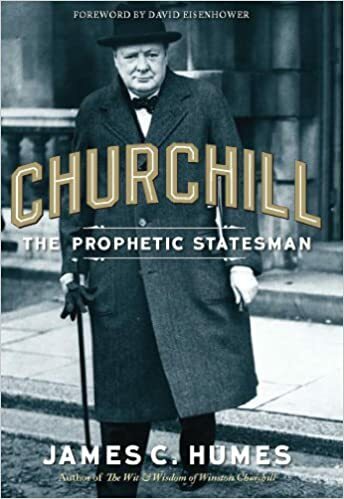 Both Truman and Attlee took shelter by disowning Churchill’s message; Truman denied that he had any foreknowledge of what Churchill was going to say. This article is part of our larger selection of posts about Winston Churchill. To learn more, click here for our comprehensive guide to Winston Churchill.. This article on the Iron Curtain speech is from James Humes’ book Churchill: The Prophetic Statesman. Please use this data for any reference citations. To order this book, please visit its online sales page at Amazon or Barnes & Noble.